Tue 16 Aug 2016, 9:44 am. Highpoint #44. 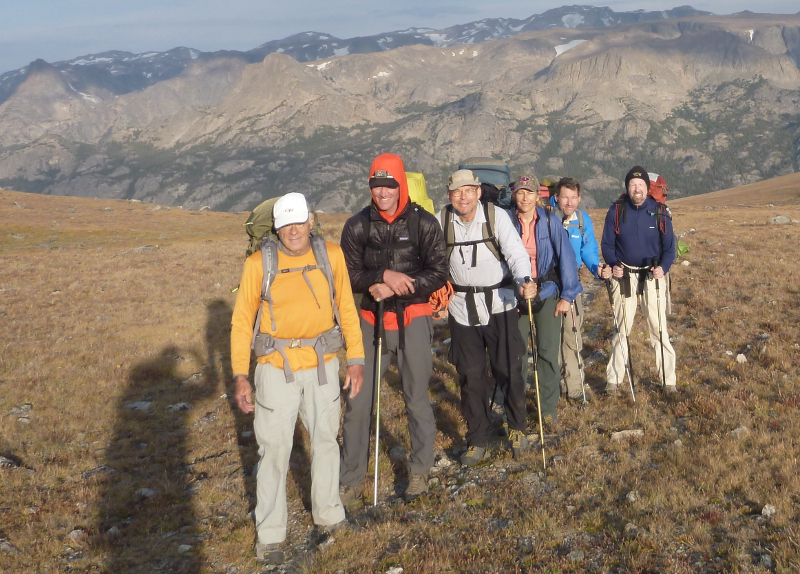 To coincide with the 2016 Highpointer Club convention in Red Lodge, MT, I decided to sign up with Jackson Hole Mountain Guides, for a climb of Gannett Peak just after the convention, with with a climb of Granite Peak just beforehand. The plan was to follow the Ink Wells Trail/Glacier Trail approach, through the Wind River Indian Reservation, in five days. The afternoon before the climb started, I drove to Jackson and the JHMG office, and met our guides, Phil Jones and Colin Wann. Colin did a thorough gear check, and tried to talk me out of bringing anything that was not really needed, including DEET. They then gave me the driving directions through Dubois to Crowheart, where the group would meet at 8:00 am the next morning. I was staying in Jackson, so I would leave at 5:30 am to make the meeting, as the drive was fairly long. Next time, I would stay in Dubois (pronounced 'doo-boys' like 'cow-boys') instead of Jackson. Dubois was a lot closer to Crowheart, and the early morning drive from Jackson with wildlife was dangerous. Dubois had plenty of motels and other resources, and it was probably cheaper. I found Jackson to be expensive and pretentious, and I did not really like it that much. The next morning, Sun 14 Aug, I left Jackson at 5:30 am on the drive to Crowheart. We would meet at the Exxon station at 8:00 am. At Moran Junction I turned west on US-26 towards Dubois. Counting miles after a stop at an Exxon on the west edge of Dubois, at 26 miles I drove through Burris, and at 32 miles I reached the Exxon in Crowheart. There was not much else to Crowheart, but the store seemed to be very well stocked. There was a variety of food, gloves, and other supplies for sale. I was the first to arrive, but soon was joined by Phil and Colin, and then the rest of the group. Besides the guides and myself, our group was Chapin from MN, John from OH, Eileen from AZ, and Perry from FL. We now had to pay the fees for crossing the Wind River Reservation, which were considerable, and payable in cash only. The guide recommendation to have $500 in cash is on target, and this does not account for tips at the end of the trip. First, at the Crowheart store, we bought fishing permits for about $75, good for one week, from the reservation. These were required, even though we would not fish. Then, we drove next door, and paid about $375 each to Ramona, for the drive across the Wind River Reservation to the trailhead. We parked our cars here, and left them during the trip. The house is a little off the main road, and this seemed like a safe parking spot. The guides handed out group gear, and we loaded up in a 4x4 pickup, and Taylor drove us on our way. If you take this approach, make sure to have enough cash! Taylor was related to Sacajawea, she was his 5th great aunt, I think. The road was quite rough, with the hardest part was a rough streambed crossing, followed by a steep climb on the other side. I got to ride inside, in the front seat, which was reasonably comfortable. Those in the back in the bed found the ride a little less luxurious than I did. After about an hour driving, Taylor dropped us off at the Cold Springs trailhead, at about 9500 ft, at the start of the Ink Wells Trail, a little before 10:30 am. We loaded up our packs, and got ready to head towards Gannett. Looking back at the road to the trailhead where we were dropped off. 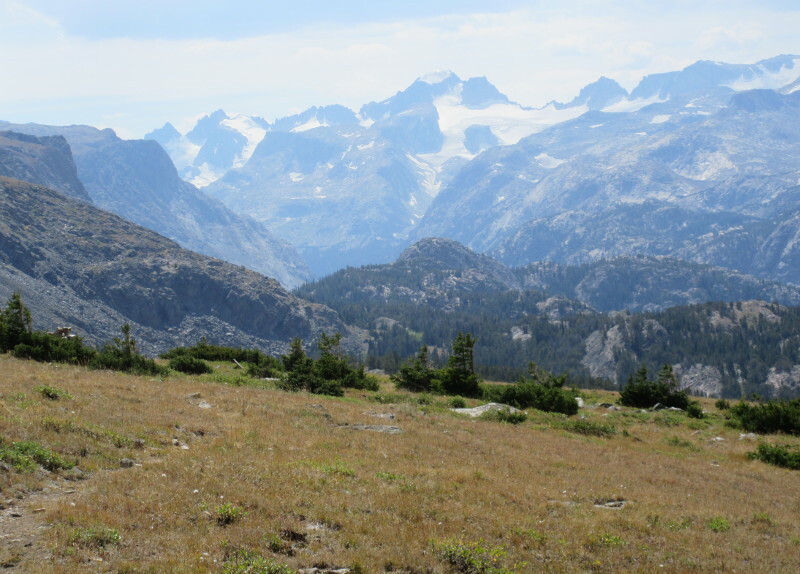 We soon crossed the wilderness boundary and a fence, then started to hike up the nice and easy, but at times ill-defined trail to Scenic Pass, at about 11400 ft, which we reached a little before 2:00 pm. It was windy there, but clear and warm otherwise. From the pass, we had nice views of the peaks beyond. We then descended (more than I really wanted to! ), and turned left. I think we took a little shortcut around the turn. About an hour after starting the descent, we had our first views of Gannett Peak. Our views were of the north side, while we would actually climb it from the south side. We never really got a view of the side that we climbed until summit day. Our first view of Gannett Peak, soon after starting the descent from Scenic Pass. 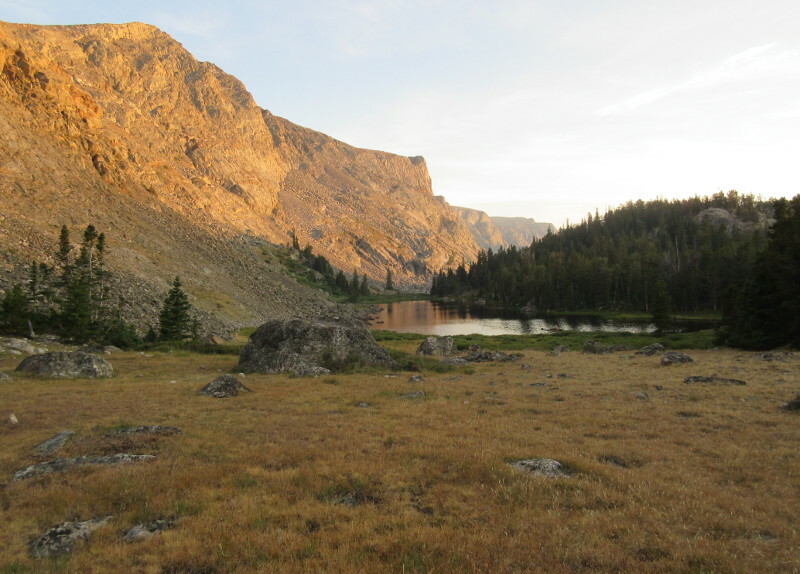 We hiked on, gradually descending, towards our planned campsite near a small lake. Shortly before the lake, we passed through a marshy and boggy area, which was supposedly usually mosquito infested. But they were only mild irritant for us today, I think that the area was drier than normal. We reached our campsite next to the lake at about 4:20 pm. I think that this lake was unnamed, but located near to Echo Lake. The lake was pretty, and a convenient water source. Near dusk, the mosquitoes got more active and irritating, but a rain shell kept them at bay. I did not regret not bringing DEET, it would have been unnecessary extra weight. Nice twilight views of the lake near camp 1. The next morning, Mon 15 Aug, we packed up camp, and continued southwest on the Ink Wells Trail, with an easy descent to Dinwoody Creek in about 1.5 miles. There is a well-constructed bridge over the creek, and we took a rest break just after the bridge at around 9 am. We then joined the Glacier Trail, the other main approach from the north and east sides. 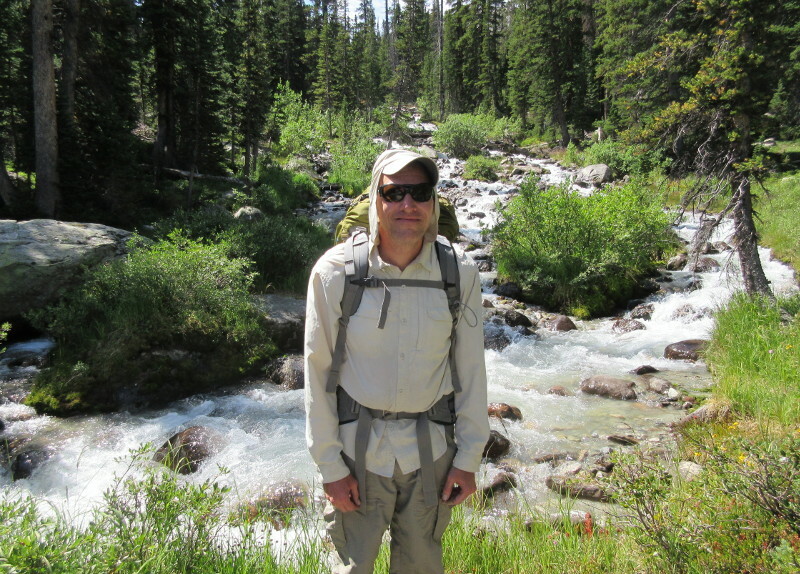 We then hiked southwest, on generally mellow trails, through Wilson Meadows and along Dinwoody Creek. 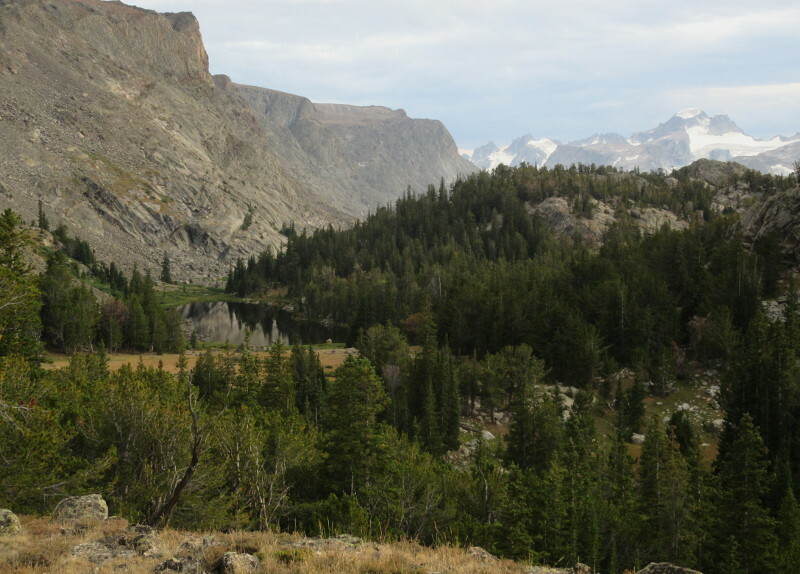 This was a very pretty area, with views of the meadows, streams, and peaks, including Gannett. We still were unable to see the side of the peak that we would try to climb. Gannett Peak rising above Dinwoody Creek and Wilson Meadows. As we hiked up Dinwoody Creek, we had several crossings over streams with log bridges, which took a little care and balance. Eventually, we went left past the east side of Gannett, and turned right to come up on the mountain from the south, the side that we would climb from. We reached camp at 1:10 pm, on the tundra covered Dinwoody Glacier moraine, just above the creek, probably at about 10800 ft. The hiking this day was pretty level, we did not really gain much altitude. This camp was lower than Scenic Pass where we had been on the first day. The creek provided convenient water access, but the water was very silty. I did not bring the cleaning syringe for my water filter, but fortunately Perry did, so I did not have to find out if my filter would have become clogged. Bring the cleaning syringe! A SteriPen might not work here with all the silt. From our camp, we could see the first part of the route for the next morning, up the trail towards the boulder field. Me next to one of the stream crossings. Looking up the trail to the boulder field, from camp 2 the afternoon before the summit attempt. My watch alarm woke me at 2:00 am on Tue 16 Aug for our summit attempt. I supplemented the group breakfast with my own Fruit Loops and an cup of cider. I like to have two hot drinks in the morning if I can, for the hydration. Two coffees can also work. After preparations, we left camp at 3:10. After about 20 minutes on a nice trail, we reached a boulder field, and then had to work through a maze of large, about car sized, talus. Supposedly this was reminiscent of the Longs Peak boulderfield. We then crossed an icy section, which was slippery and treacherous, and then crossed a stream by hopping across rocks. We put on crampons in the dark for a short snow field, then removed them when we came back to rock. 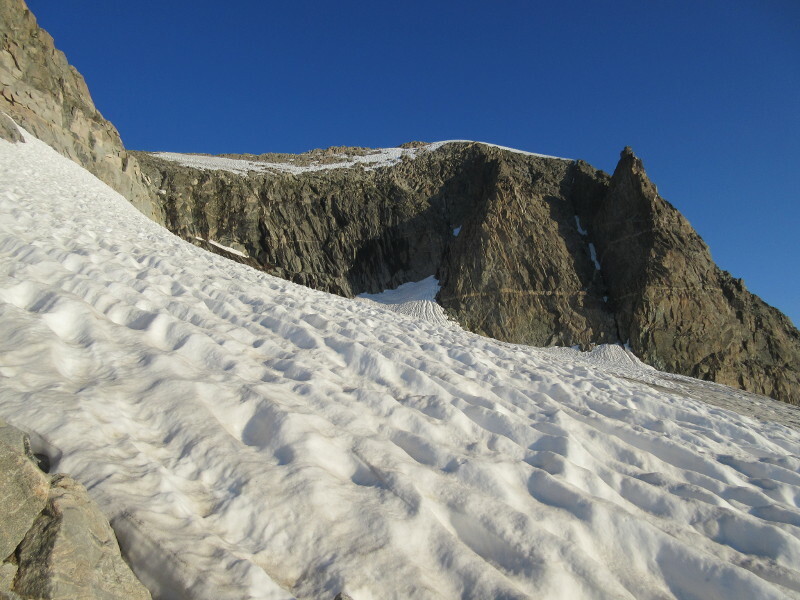 Around 7:10 am, we came to the Gooseneck Glacier, and had our first look at the south face of the peak. We put crampons on again, and then started with the technical section of the climb. About to step onto Gooseneck Glacier, with the couloir above and to the left out of view. 7:11 am. We started out on the glacier unroped, heading gradually to the left up steepening snow until we reached the bergschrund. There was a good place to stand on the left side below the bergschrund. 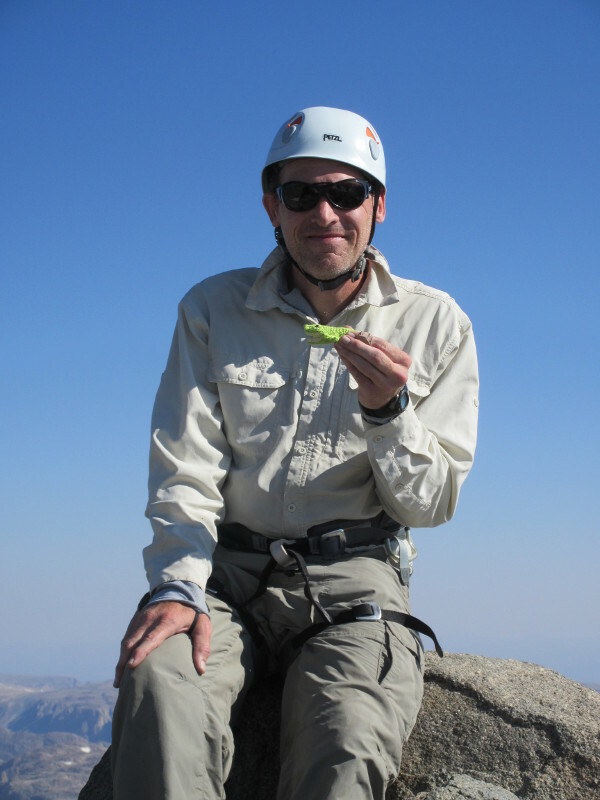 We roped up here and prepared to ascend the Gooseneck Couloir. Phil climbed up up the snow on the couloir to the left of the bergschrund, set some pickets for protection, and then the rest of us followed, climbing simultaneously while roped up. 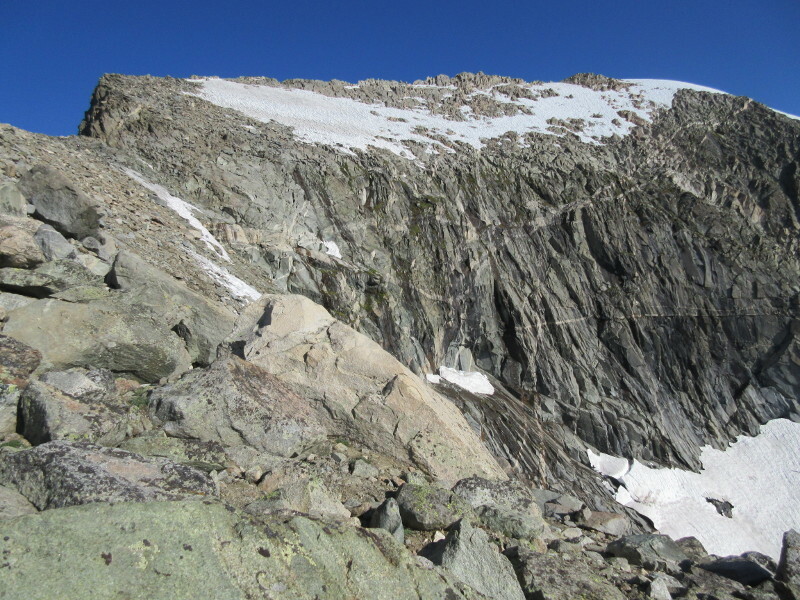 It was straightforward to climb up to the left of the bergschrund, but the snow was steep, and icy in places. After reaching Phil, he climbed up farther, set more protection, and the rest of us followed again. After 2 or 3 pitches, we reached the top of the snow in the couloir. As we reached the top of the couloir, we headed to the upper right corner of the snow, and unroped. The rock was horribly loose here. We climbed up a fairly steep rock ridge to the right, which led to the top of Gooseneck Pinnacle. It was also possible, instead of directly climbing to the right, to head straight up, winding along a trail through less steep but very loose rock. There was another solo climber heading through this section at the same time, he went up this less steep section, dislodging plenty of rocks as he went. The steeper route to the right avoided much of the horribly loose stuff. I saw at least one spontaneous rockslide here. Supposedly, this section usually had more snow, which covered up this loose rock. But much of the snow had melted off of the route by this time, so we did not have this protective cover. Once we climbed above this part though, the rock was mostly good and not too loose. We continued climbing mostly third class rock, ascending above Gooseneck Pinnacle. Looking at the saddle joining the summit ridge, from above Gooseneck Pinnacle. 8:45 am. We continued climbing up a saddle, to a steeper section where this joined the summit ridge. Then we turned right along the ridge. This was almost entirely on rock and not snow. We followed the ridge with easy climbing to the summit. Phil, Chapin, John, Eileen and myself reached the summit at 9:44 am. There was one particular boulder that was highest, so we all took our turns on the top. 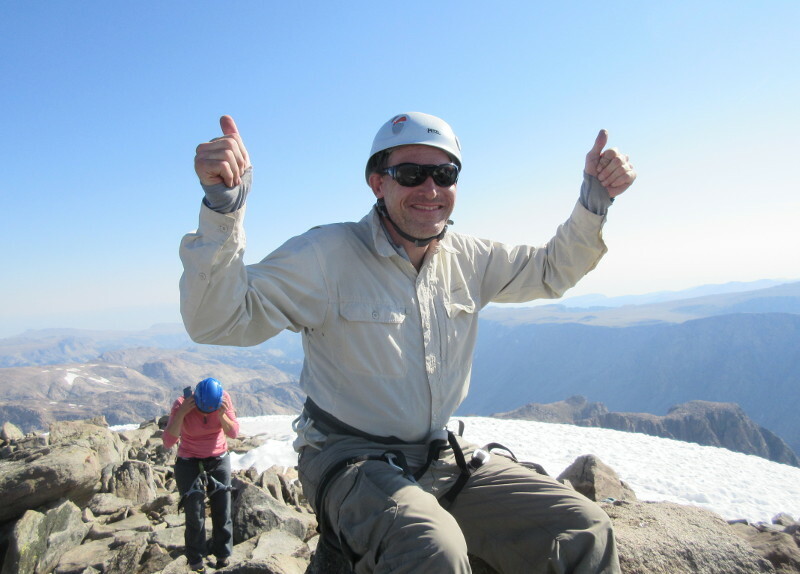 There was no wind, the weather was perfect and warm, and we enjoyed the spectacular views from the summit. Colin and Perry arrived a little later. After staying on the top for about an hour, we started back down. Me on the highest point, with Eileen waiting her turn. This crocodile came out for photos on the summit. Phil checks his phone on the summit. 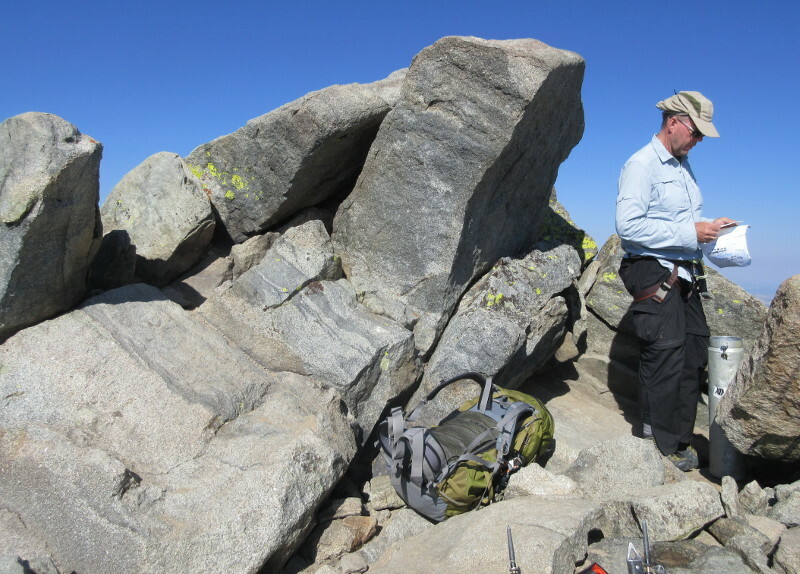 John checking out the summit register, with the highest boulder just behind him. View from the summit, looking down on Gannett Glacier. Looking down at Bonney Pass. 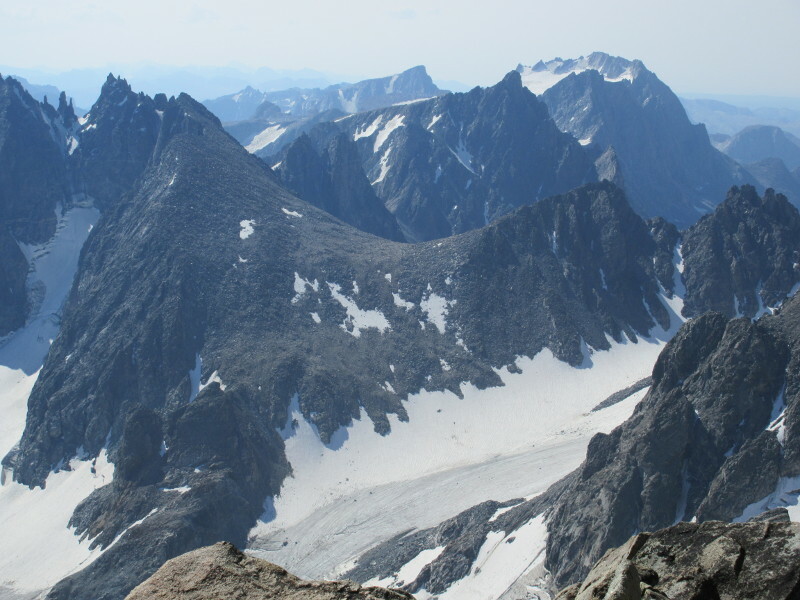 The south/west approach involves climbing this twice on summit day, along with Gannett itself. 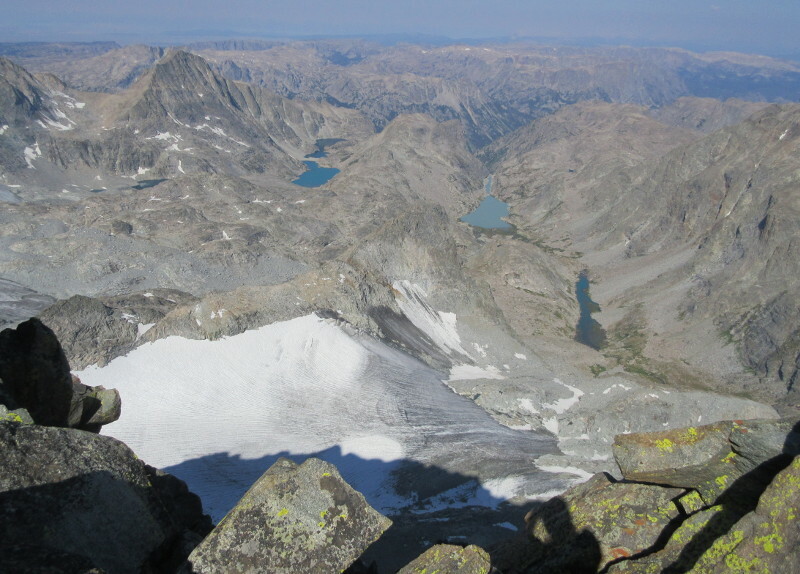 We started down the same way we ascended at first, downclimbing until we reached the top of Gooseneck Couloir. At this point, we descended down the less steep but loose trail that wound through the rocks, instead of the steeper rock that we had climbed on the way up. We had to avoid touching the very loose rocks, which would slide with the slightest contact. The final steps down to the top of the snow were steep and I hesitated a bit, but Eileen gave me some encouragement, and then I walked down the last few feet to the rocks at the upper right corner of the couloir. This was our 'safe' (hah) place to put on crampons and rope up for the descent down the couloir. Here I made a foolish mistake and forgot to put on my gloves before the descent down the snow. Phil set up some pickets for a belay, and the rest of us then downclimbed the snow on belay. My ungloved hands quickly got nice and cold from the snow as I descended. Fortunately, Eileen had a spare pair handy, and loaned them to me to keep my hands from freezing. Thanks! After descending to the bergschrund, we unroped and continued individually down the snow slope of lower Gooseneck Glacier. I managed to slip a couple of times, and got to practice my self-arrest technique. Near the end of the glacier, Phil pointed out some gaps, little crevasses, underneath the snow surface. I made sure to avoid these, and made my way to the rock past the end of the glacier. We then continued descending on rock and trails. Towards the bottom, we took a different path than we did on the ascent, and so skipped the other sections of icy snow that we had ascended, in exchange for more boulders to negotiate. Eventually we made it through all of the talus and boulders, and reached the nice trail. From here our camp was just a few minutes away. We made it back to camp just before 4:30 pm, which made this over a 13 hour day. I was ready to devour dinner, then headed to bed for some rest before the hike out starting the next day. We woke up the morning of Wed 17 Aug and enjoyed a leisurely breakfast, along with a visit from a hummingbird. We packed up and headed back the way we had come. 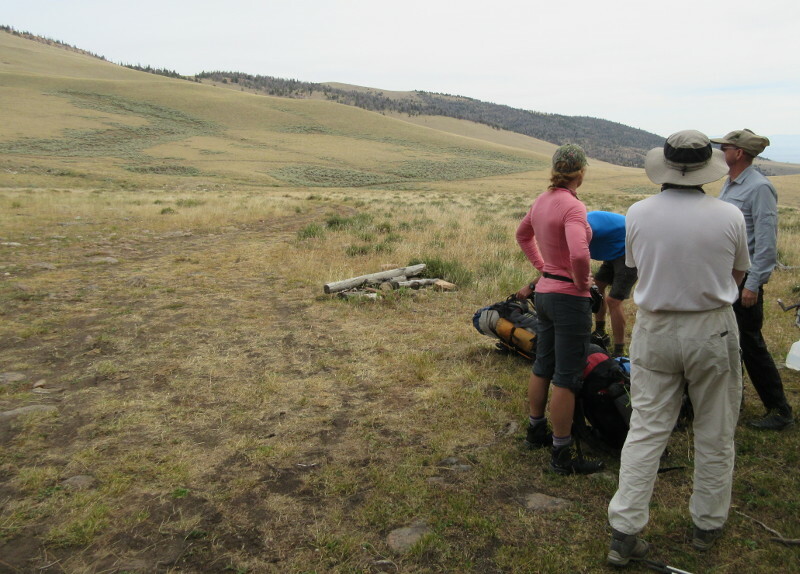 On the way, we passed an archaeological group from Central Wyoming College. Supposedly, there are sites in the mountains which are around 12000 years old. It is interesting that such very old sites are up in the high mountains. We reached our first campsite, then decided to move a little farther, up the next hill, to make our last day a little shorter. This higher spot had a nice view of Gannett overlooking the lake that we stayed next to on the first night. We had a little rain shower as we setup camp, but it never got too heavy. at this campsite, but this never became heavy enough to be a problem. View of Gannett from our campsite the last evening. We had to meet our ride at noon, so we rose early to make sure we had enough time. But we made good time and arrived at the trailhead early, and in fact had no need to hurry. It was a bit of a chore to climb back up to Scenic Pass, but not really so bad. As we hiked down from Scenic Pass, on a nice and relaxing steady descent, we saw pronghorn antelope, and heard the calls of coyotes. The last part of the trail was the hardest to follow, as it was very indistinct. The group had become a little separated, with different people moving at different paces, which made it harder to follow the vague parts, if you could not see someone ahead of you. We returned to the trailhead at about 10:20 am, and relaxed while we waited for our ride, this time Taylor's mom. She arrived a little early, so we were on the way back before noon. Somehow I got to ride inside again. We returned to Ramona's house, returned the group gear, tipped the guides, and said our goodbyes. Our Gannett group. From L to R, Perry, Colin, John, Eileen, myself, and Chapin. Phil's shadow at far left is taking the photo. There are three main approach routes to Gannett, all of which reach the summit by basically the same way. Two of them come in from the north and east: The Ink Wells Trail is the way we came (across the reservation to the east). You can also take the Glacier Trail from the north. We joined this second route early on our second day. Using the Glacier Trail the whole way would avoid paying the exorbitant fees for crossing the reservation, at the cost of 17 extra miles hiking. 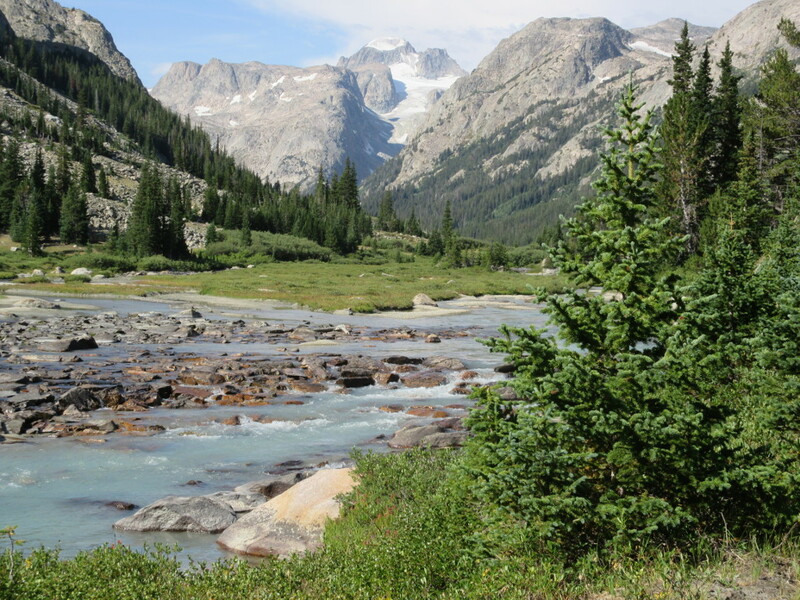 But JHMG does not run many trips on this side, and all are via the Wind River Reservation. Apparently, the officials are a lot stingier with use day permits on this side, so the guide service chooses the route needing the least use days, the Ink Wells approach. 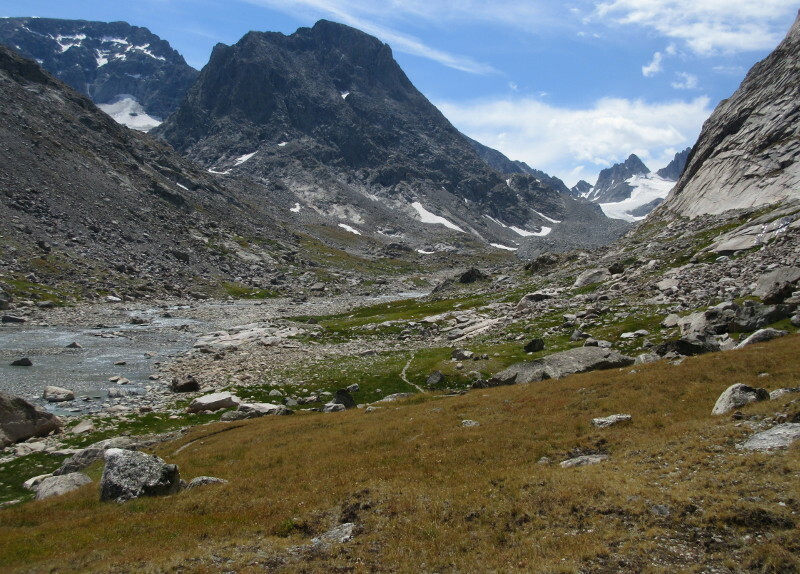 The other main approach is from the south and west, via Titcomb Basin. This is the approach that JHMG uses for most of their trips, but it is not because it is easy, it is because it is easier to get guide permits on this side. This approach is supposed to be really pretty, especially at Titcomb Basin, but it means that summit day gets the additional tasks of climbing Bonney Pass twice, which looks like a real chore. You would probably get out of some of the boulder field though. 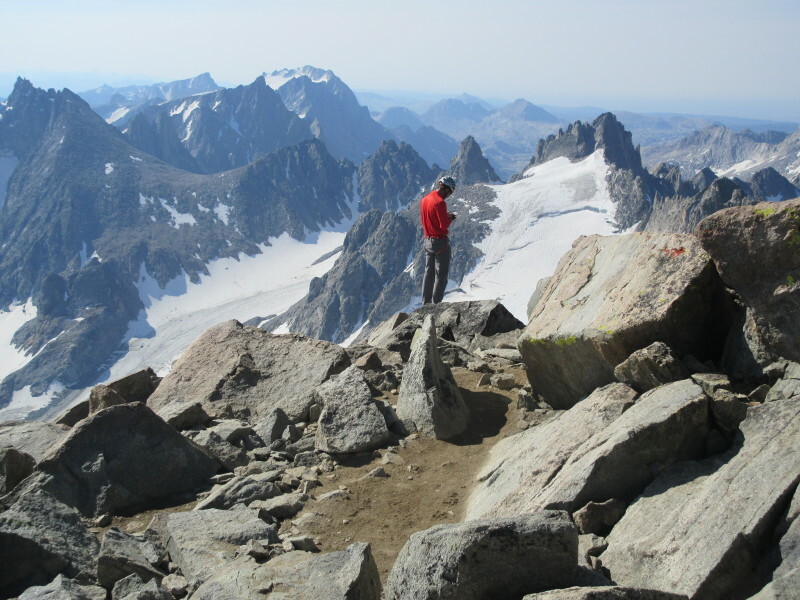 The best plan to me, is to use one of the north side approaches to actually climb the peak, but come in to Titcomb Basin for a nice backpacking trip. You could then climb the pass (just once!) and maybe get a nice view of Gannett. Highpoints of the United States, Don W. Holmes, University of Utah Press, 2000. Ramona O'Neil - (307) 486-2318 - I think that this is the Ramona that we dealt with for the drive across the Wind River.